Last year witnessed the release of some top-notch gadgets. Major brands like Apple, Samsung, LG, Sony etc came up with latest gadgets and technology. All in all, 2017 was a year of VR, AI, Wearables and smartphones. From Apple iPhone X, Google Pixel XL 2 and Samsung Note 8 there were numerous gadgets being released. While technology did not disappoint users in year 2017, but it definitely has notched up our hopes for the year 2018. The good news is that there are a multitude of gadgets and new technology expected to be introduced this year. One of the most awaited month of the entire year for tech geeks. Every year January witnesses CES conference, the most awaited tech event. CES gives all the leading brands a chance to showcase their latest tech gadgets ranging from smartphones, VR gadgets, AI, home appliances etc. Companies also announces their gadgets and products in CES that are supposed to be launched in near future. February is expected to be the month of release of some popular flagship phones by famous brands. All thanks to the Mobile World Congress (MWC). March is supposedly the month already taken by Apple. One of the important month in tech world, all thanks to Apple. March 2018 may see new iPads and the successor of iPhone SE. It is also said that iPads may have the FaceID feature of iPhone X. As per last year’s launching trend, it is expected that April may see the release of HTC’s flagship phone. It is assumed that the flagship phone by HTC would be named HTC U12. Facebook’s F8 Conference happened in May last year, following the trend it is also expected to happen in May this year. F8 Conference usually showcases the upcoming plans of Facebook for its users. The month, may also witness the Annual Developers conference by Google, Google I/O. It is assumed that Google will roll out its next gen Android OS in it. The next-gen OS id named “Android P”. June is the month of Annual Developers conference WWDC by Apple. Annual Conference is one in which Apple unveils its major OS update every year. Year 2018 is waiting for iOS 12 to be released. Another big news of June is the launch of OnePlus 6. It is assumed that the product may be unveiled at the MWC conference. Past 2 years, July has been blocked by Motorola to launch its new smartphones. July 2018 is expecting the launch of third generation of Moto E series. August is most likely to be the month of release of Nokia flagship phones in the HMD global conference. Adding to Nokia, August also saw the release of Samsung note 8 in year 2017 and the same is expected out of August 2018. Samsung is supposed to launch its flagship phablet in August 2018 i.e. Samsung Note 9. From the list of most awaited gadgets and tech in Year 2018, September is the month for Apple. The world-famous Cupertino-based technology company, Apple every year unveils is next iPhone. September 2018 is waiting for Apple to roll out its new iPhone 9. Just like September seems to be pre-booked by Apple, October is by Google. Google every year in October reveals its new smartphones in Pixel series. 2017 saw the launching of Pixel 2 series. Let’s see what has October 2018 got for us. If the buzz is to be believed November 2018 may see the release of a new smartphone by Motorola. One Plus has a set a trend of launching new smartphones every six months. Seeing its cycle, it may come up with OnePlus 6T smartphone in December 2016. 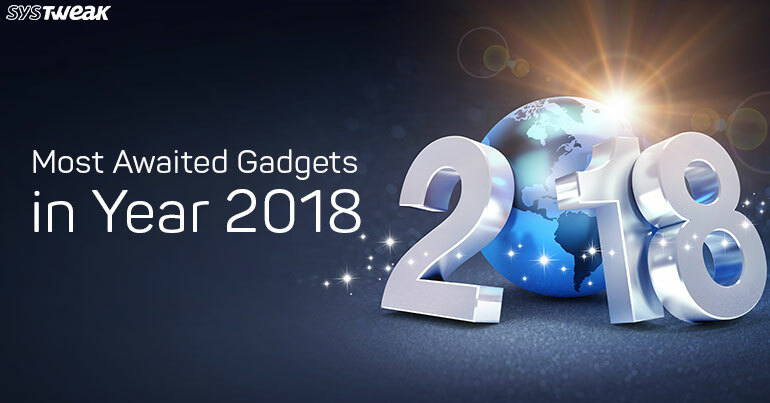 Well, 2018 is the year of some of the most awaited gadgets and tech. Let’s see how these turns out to be.